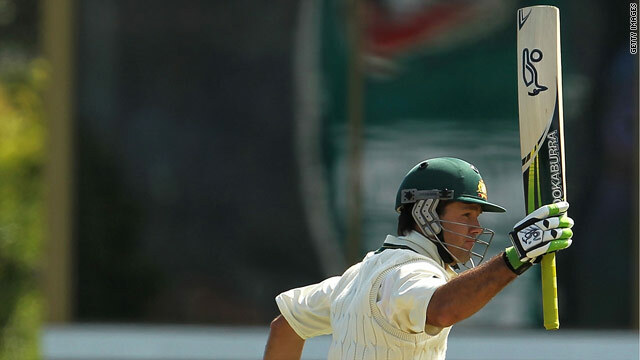 Ponting raises his bat in triumph after posting his 39th Test century and second in his native Tasmania. (CNN) -- Australia captain Ricky Ponting hit his 39th Test century as his side took command of the final match of their series against Pakistan in Tasmania on Thursday. Ponting has struggled for runs in the previous two matches and should have departed without scoring as he was dropped by young paceman Mohammad Aamer on the boundary off Mohammad Asif. It proved a costly mistake as he combined with vice-captain Michael Clarke for a record unbroken fourth wicket stand against Pakistan of 231 to leave the home side on 303 for three at stumps in Hobart. Pakistan, who skittled the Aussies for just 127 in their first innings in the previous Test in Sydney, but still contrived to lose, looked set to repeat the feat as Simon Katich, Shane Watson and Mike Hussey departed in the morning session, but Ponting's lucky escape after a mishook proved crucial. Aamer, who claimed the wicket of Hussey in a fine opening burst, with Asif and Umar Gul sharing the other two, showed considerable promise, but he was mysteriously under bowled by captain Mohammad Yousuf in the afternoon session after his catching error. Ponting, who was averaging just 27 in the summer Tests in Australia going into the match in his native Tasmania, reached three figures in 159 balls with 13 fours and was 137 not out at the close. Clarke also reached his ton, his 13th in Tests, and ended the day unbeaten on 111. Australia are leading the series 2-0 after wins in Melbourne and Sydney. In one day international action, Mahela Jayawardene and Kumar Sangakkara made half centuries as Sri Lanka beat India by four wickets to win their triangular series in Bangladesh. Jayawardene steered them home with an unbeaten 71 and skipper Sangakkara made a rapid 55 as Sri Lanka overhauled India's below-par score of 245 with over an over to go. Suresh Raina made 106 in India's innings but his efforts proved in vain.